The the race four weeks away I’ve been vacillating over the final route. After lots of deliberations—and advice from my riding buddy Mike and Jok who is recovering from his training crash the die is (sort of) cast. If I don’t get lost, go off route I’ve got 3,471 km of riding to do, with some 35,115 m of climbing. Makes me tired just thinking about it … but what a holiday! The elevation profile shows a few hills on the way! The number 8 road from Sofia through Plovdiv to Edirne. This road is at times narrow with no shoulder and very fast moving traffic including trucks which will attempt to overtake despite your presence. Of all the roads that Transcontinentalists in 2013 travelled on, this was reported as the out and out worst. Avoid it like the plague. Now just to try and get a lot more training in over the next few weeks before I begin to taper. My bike and kit is all sorted out and working great. Just the body needs work! 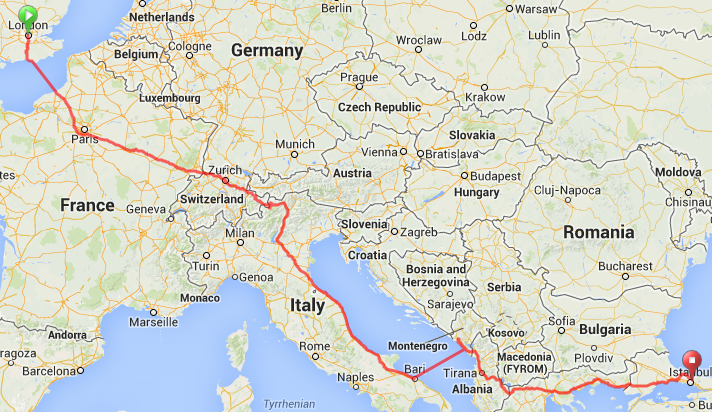 Update July 29: My colleagues from the World Bank’s Albania office have given me a recommended route through Tirana. I’ve also decided to cut through Macedonia rather than Albania all the way to Greece – looks like better resupply points. So this gives me 3,468 km of riding and 34,923 m of climbing. Saved 3 km and 193 m of climbing! Outside Magazine has an excellent interview with Jefe Branham who won the 2014 Tour Divide—just outside record time in spite of absolutely appalling conditions—the number two ride was some three days behind. Very insightful and thought provoking about what these sorts of endurance races mean. I’m glad they show the Tour De France is easier—short distance over a longer time. The TDR really is the toughest race!